Sherie and Ben were so conscientious in December to follow the workout plan. A regular rhythm developed in our morning routine, with neat check marks in all the tracking squares for the first four weeks of the month. And we felt good, even though the holidays were barreling full speed right into our faces. On December 24, we left for a week at a tiny resort in rural Pt. Arena, California. 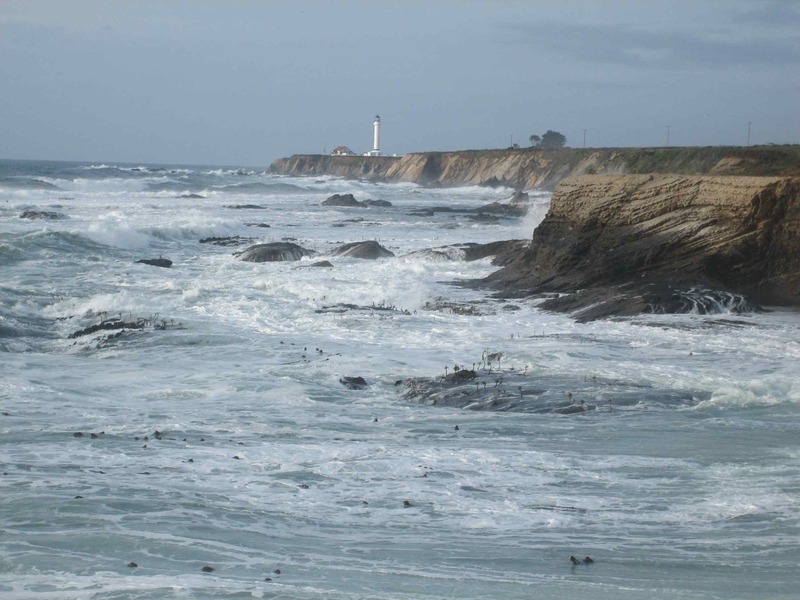 On the southern Mendocino county coast, the Lighthouse Pointe Resort has a few dozen single-wide trailers in an old trailer park. Anyway, the best thing to do is to throw the workout schedule out the window and take advantage of the opportunities of the day. And because the winter storms were rolling through one day, lingering showers and dampness the next, one day of clearing, and then the next, the opportunities were short in duration. Did I mention it was cold, too, with highs in the 40s F? When we arrived, it was the day after a storm, with lingering moisture on the roads in the deep shade. So we decided to ride our bikes anyway, a short “warmup” ride. Little did we know that the Eureka Hill Dr (the alternative road to Hwy 1) would have grades to 14% just out of town. And it is almost never flat, always going up or down, rolling near the top of the ridge that separates the coast from the San Andreas fault. So an easy warmup 20 miler turned into a burn fest, alternating the heat generated climbing with the chill of descending in the very cool damp air. When we returned to the cabin we had cold toes and fingers, welcoming the warmth of the fireplace. The following days brought lots of wind and rain, keeping us inside trying to be musicians with short forays outside jogging or walking in the mud of the nature preserve. However, the peaceful setting was great for our moods. On Ben’s birthday, the day was clear to be clear and cool. Ben had been wanting to ride his bike on King Ridge for some time, and this day was to be the key opportunity of the week. Of course, Ben wanted to do the interesting variations as well, so the day turned out to be pretty epic for your Maratona Dreamers. A real birthday present to himself indeed, which Sherie’s compliance. We drove south on Hwy 1 to Stewarts Point to park and start the ride. The warm up south on Hwy 1 rolled up and down above the cliffs, descending into the various stream crossing then traversing besides the cow pastures on the bluffs. Great views of the rocks and crashing waves, some foggy patches and some sunlight bouncing off the water. 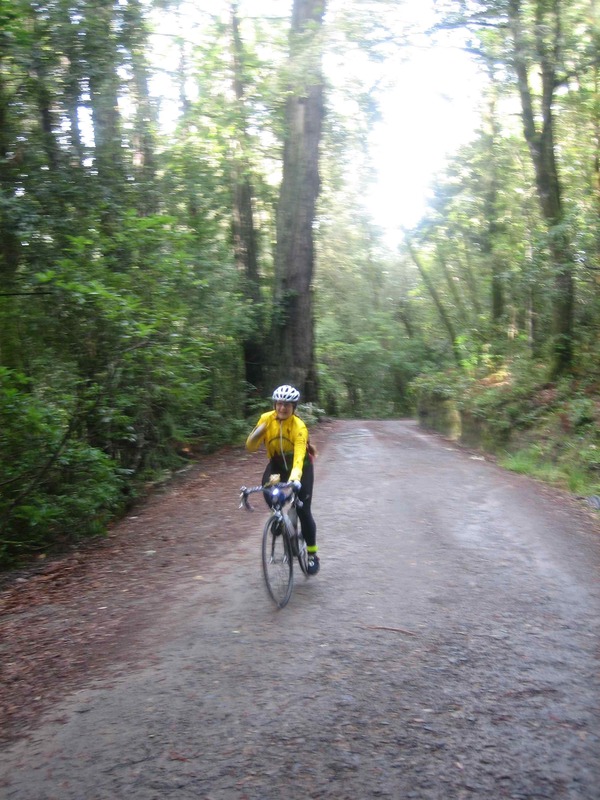 Ben wanted to ride uphill through Kruse Rhododendron Reserve. The websites indicated that this was passable for road bikes, even though much of the road is not paved. And indeed the ride, though a steady uphill grade, was neither too steep nor too loose for our 23mm tires as we climbed in a tree tunnel through the rhododendron and conifers. Very green and peaceful, the occasional stream crossing announcing itself with the rising babble before fully seen. Made us want to come back in the spring when the rhodes would be in bloom. When we emerged above the reserve to pavement at Kruse Ranch , we thought the hard part of the road was over. This beautiful ranch house, barn, and assorted paddocks and outbuildings shone in the sunlight, a bright contrast to the muted shade in the reserve. The greening pastures were damp in the morning sun, and a dog or two greeted us with barking. As we passed, we noticed that the pavement ended and the road turned to mud. Not hard packed like below, but deep enough to leave a little trench in your wheel track. So one had to shift down and pedal pretty hard to keep the momentum going forward. And then the road steepened to at least 12%, and we had to stand up and really pull hard, seeking some line on the road less muddy to keep up our momentum. After what seemed like forever (something over a half mile? ), having managed to stay on the bike and not walking in the mud, we emerged to the pavement at Seaview Road. We cycled on Seaview Road south, rolling up and down again near the ridge top. It eventually become Meyers Grade Road for the descent back down to Hwy 1 just north of the big hairpin descent above Jenner. Meyers Grade is steep, but at least we were descending. And then the big views on Hwy 1 greeted us below. 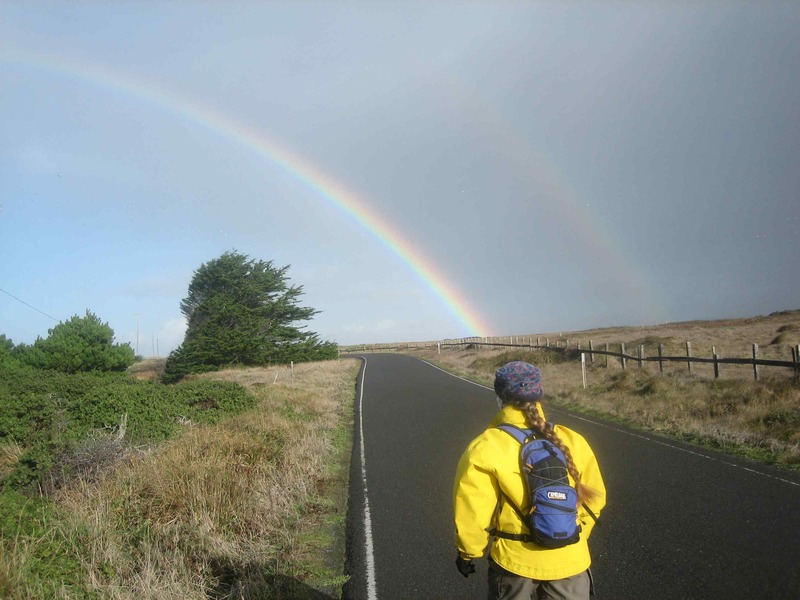 As Sherie and Ben found out, while it may be like many other NorCal roads, it is indeed special. 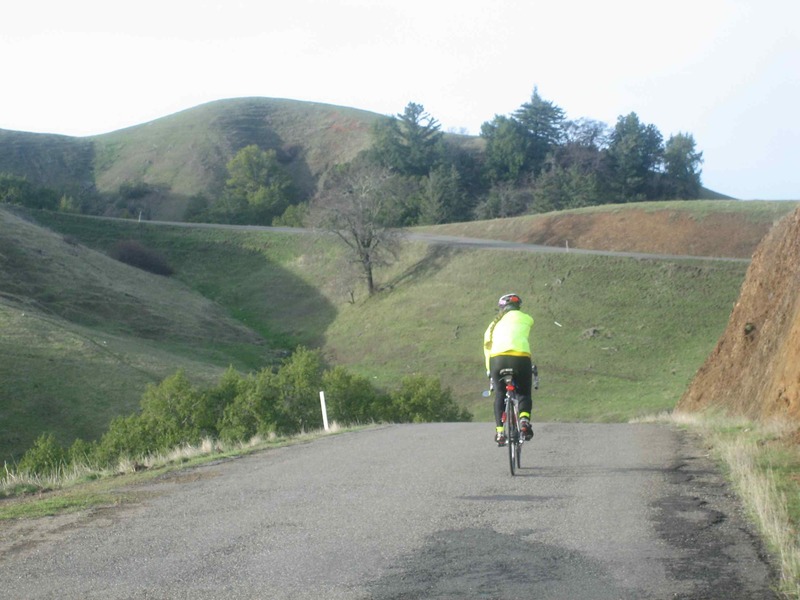 The climbing out of Cazadero to the ridge top is continuous; the grade steepens a bit at a time, and one sees a curve ahead, wondering if the grade eases. But it almost never does, just turns up the screws another notch until you’ve been climbing out of the saddle for a good mile with grades up to 15% or so. After what seemed like forever, Ben stopped to await Sherie where the road eased off onto the top of a sub-ridge at the beginning of a traverse. Because Sherie has lower gears, and often a lower cadence, it is not unusual for Ben to await her at the top of a hill. This time the wait was long, and when Sherie appeared her elation was very much tempered by the pain of lactate acid legs. And a quick snack and drink did not revive her; between the hard work on the uphill muddy section of Kruse Ranch Rd, and then this killer mile, Sherie’s legs were spent. Ben figured we had about 20 miles yet to go…and nightfall was about 90 minutes away. Time to get moving! The ridge itself is stupendous, with the road on its crest with occasional traverses left or right! Big views east down to the gorge and up to the next major ridge, miles away. And lower ridges west, with the Pacific beyond. Of course, the ridge traverse is never really flat, but up and down. Just cattle pasture and forest, mile after mile, with the occasional ranch building. And some of the ups are steep, although short, requiring a burst of energy in or out of the saddle. But because Sherie was gassed, we just had to go slowly and steadily. The road itself is about a lane and a half wide, which makes it feel so nice on a bike, but requires care when the very rare car decides to go by. Now Ben did not plan the short and quick way off of King Ridge, but the extended version onto Tin Barn Rd (hence the start at Stewarts Point.) This was much like the King itself, but a tad lower, working through wineries now and onto ranchettes instead of real cattle spreads. When we finally turned left for the return to the coast on Skaggs Springs Rd, and the darkness crept closer, the shadows under the conifer deepened and the dampness emerged onto the roadway. Ben did not tell Sherie about that last uphill, out of the San Andreas Fault valley up to the coastal ridgetop. But she plugged away up a few hundred feet again, out of power and almost out of daylight. The quick descent to the coast was at last light, Ben anxiously looking for the car in the little parking lot just across the highway from the store at Stewarts Point. We were both so glad to be there. Something like 65 miles and 6600 vertical feet. It was a day when we went deep on the energy, but experienced such new and beautiful terrain. The challenges of the mud, steeps, miles, and short daylight hours don’t seem to lessen the memories of pastoral Northern California at its finest. Of course, the next day we were hammered. In fact, we were so hammered that evening that cooking Ben’s birthday dinner (rack of lamb) in the tiny kitchen took some will to marshal the energy. (Maybe that great Cabernet caused inefficiency as well?) It took a day or two of resting, walks, and napping in the storms before we completed one more bike ride on the last full day in town: to Gualala for lunch. And of course we had to to ride the interesting route inland on the ridge, up the steep grades, to avoid Hwy 1. So that last week of December we ignored “the list” and were just active in whatever way the day presented. We had one really demanding ride, some power hill training on shorter rides, and some cross training walks and runs. Not to mention some quite time to get reacquainted with each other and our musical instruments. 1 Response to Plan Interrupted by Holidays, Oh Yeah! Looks like you may live somewhere in the Northern Cali area, there is a great race/ride like a Gran fondo in early May up in Ferndale, Ca. that is called “The Tour of the Unknown Coast”, 100 miles and 10k of climbing and a superb route, a great training goal for the Maratona.